Birds in the garden offer many benefits. Their songs brighten the dullest morning, and it’s great fun to watch them grow, play and search for food. They also eat their share of pesky insects and bugs. Bird feeders are one way to encourage birds to visit the backyard. Homemade and store-bought feeders attract birds equally as long as they can reach the seeds they’ll eagerly gobble-up. 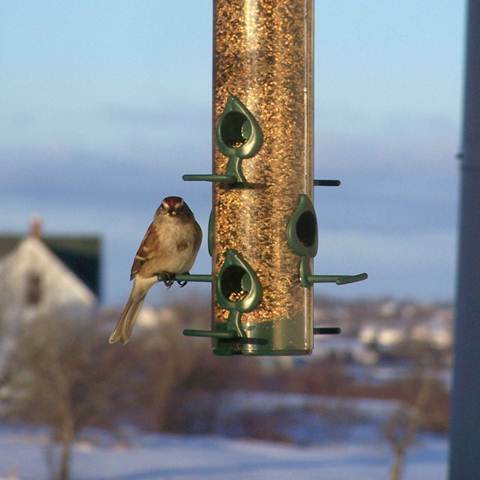 If a feeder is maintained through winter, it should be continued through summer. Birds become dependent on it while feeding hungry hatchlings. Hummingbirds love red flowers, including red tulips and red daylilies, but not everyone can keep enough red flowers in bloom to feed these active birds. This is where feeders come in handy. Various types, including ones that stick to windows, are available.